The BBK BitTorrent Box is finally here. The set-top runs on Android and will allow users to stream files downloaded through uTorrent right to their TV. Additionally, the box can download torrents itself, and can playback all types of video formats including MKV, AVI and WMV. The device supports DLNA, meaning it can access your other media libraries, as well. Perhaps most importantly, because the device is Android, users can install VPN apps before beginning to download. The box sells for 89 euros and will ship only to European nations. No innovation. Just another obscure manufacturer trying to make a penny on the popularity of "piracy". This box doesnt seem to be capable of doing much else that other older Android boxes already do. 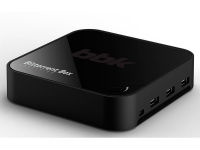 The G-Box Midnight for example,or plenty of other "Android TV" gizmos, with XBMC pre-loaded and,a free torrent app from Android Play Store...And for less money. Yeah...that's some pretty niche marketing there. I just don't see people needing a dedicated torrent box. I honestly don't even understand how someone could get data fast enough from P2P networks to make it viewable/enjoyable. I'd rather know specs, what else I could do with it, and how much support they put behind it for things other than torrenting.